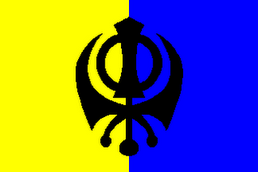 THE ROAD TO KHALISTAN: WE EXIST! It seems that Sikhs willing to testify against Jagdish Tytler and Sajjan Kumar are coming forward. We have long suspected that the reason CBI never found anyone is that they were instructed not to find anyone. Here is an article from World Sikh News, telling of the most recent to come forward. We wish we had something we could testify to, but no one of note attacked us. Our prayers are with these latest to volunteer. It is, I think, a most dangerous seva. Warning: Some of this is quite gruesome. 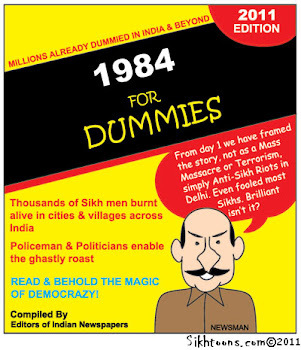 CHANDIGARH: "WE EXIST, You just don't see us" was the searing frontpage headline in a recent edition of the World Sikh News while bringing to the fore the continuous shame that haunted India as one of the other victim of the 1984 anti-Sikh pogrom came foreward to give a lie to the sham investigations by Delhi Police, CBI and others. That phenomena has caught on like bird flu for the Indian establishment. Yet another victim, a 42-year-old Sikh, has now said encouraged by other victims, he too is now willing to testify against Sajjan Kumar, the man accused by human rights activists and 1984 victims of leading the blood thirsty mobs but made a minister by Indian establishment. Gurcharan Singh, now confined to a bed and suffering, said Sajjan Kumar indeed incited the violence against Sikhs in Delhi and that he saw him actually doing that. Not surprisingly, victim after victim has been claiming that, including those that the CBI found untraceable but the media found them within hours, only to see that they stayed steadfast to what they had initially claimed. The US based Jasvir Singh adamant on testifying and the India-based Surinder Singh being caught on camera by a leading Indian TV news channel CNN-IBN narrating in gory detail how Sikhs were burnt half-alive in Tytler's presence. Gurcharan Singh now says he saw Sajjan Kumar inciting a 1,500-strong crowd to kill Sikhs in the country's capital's Newada locality on November 1, a day after Indira Gandhi's assassination. In a damning front page report on Wednesday (Jan 30), India's The Asian Age newspaper quoted Gurcharan Singh as narrating: "Sajjan Kumar told the rioters: ‘Is mohalle ka ek bhi sardar zinda nahin bachna chahiye. In kutton ko saza deni hai (Not even a single Sikh here must escape alive. These dogs must be punished).' He had come there specifically to direct the rioters, who were mostly from surrounding villages and bastis, but led by one of his henchmen, Kirpa Ram," Gurcharan Singh alleged. Then only 17 years old, the frightened young man claims he heard the Congressman's thunderous speech from the edge of the restive crowd that had collected near his home that morning. "I wore a cap over my patka (under-turban) to disguise my identity," he said. According to him, baying for blood after Sajjan Kumar's venomous sermon, the mob began fanning out and targeting homes and shops owned by Sikhs. "They first set fire to the Singh Sabha Gurdwara at Mohan Garden and then stormed our home because my father Nath Singh was the president of the gurdwara," Gurcharan Singh said, recalling the worst morning of his life. The killers did not spare any male Sikh. Gurcharan's uncle, who was visiting from Khurja, was hacked to death. His father was beaten mercilessly and left only because the attackers thought he was dead. "They thrashed my brother, Tejinder and me and flung our bodies onto a truck that they had just set on fire," he said. The two brothers were later dragged out from the smouldering vehicle by some young boys who had managed to hide from the killers. The news report continues: "Gurcharan Singh escaped with his life, but only just. He has relived the horror and pain every single day for the past 24 years confined to his bed and completely dependent on the meagre care his poor family can afford. He was presented on Tuesday before the media by AISSF faction head Karnail Singh Peermohammed. "He said he has decided to break his long silence after the recent appeal by the Jathedar (head priest) of the Akal Takht as well as positive interventions made by the Supreme Court. Gurcharan Singh believes "Sajjan Kumar was one of the masterminds of a state-sponsored genocide of Sikhs" and rightly deserves to be punished. But despite his own suffering, the bedridden Sikh nurses no grouse against anyone. "When they flung me into the burning truck I called out to Wahe Guru three times and I believed He (God) saved me for a purpose. Now it is up to Him to bring the guilty to book," he said. It is wise of Gurcharan Singh to continue to have faith in Waheguru now, because the Indian state has failed him and the so-called leaders of the community who came into some political power have since found new agendas and secularized themselves, translating secularism as a move to shun all concerns of the community and their people.